Yesterday I found my diary clear of appointments, and with the prospect of heading to Australia and then back home to New York for several months, I decided to drive south from Auckland to Tauranga. Lecretia is buried there, in a quiet, well-maintained cemetery. I also wanted to see Lecretia’s parents, Larry and Shirley, and to visit Ferdinand, Lecretia’s cat, who now lives with them. About twenty kilometres before reaching Tauranga, I began to see signs for Te Puna. Lecretia and I were married there, at St Joseph’s Church. Te Puna is a small, semi-rural community. On a whim, I took an exit off the highway and drove through the backroads, letting my memory guide me. It didn’t take long to find the church. It was smaller than I remembered. It was painted white, with a green roof, and the grounds were well-manicured. 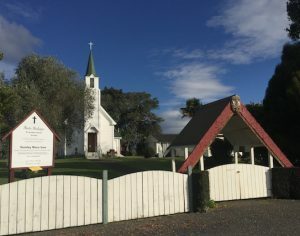 The entrance to the church grounds were secured with a white gate, over which a traditional Māori waharoa arch is placed. I undid the latch and entered the grounds, half-expecting someone to stop me. No one did. It was a Saturday afternoon and the grounds were deserted. Being far back from the main road, there was barely any sound, only a unseen tractor lumbering somewhere in the distance, and the crunch of my shoes on the gravel underfoot. I hadn’t been back to the church since our wedding day. Lecretia had often talked of going back there for a service, to sit on the pews as parishioners, and not as a bridal party, to experience the church in an ordinary Sunday service. We had done that once, before the wedding, and we found it a pleasant experience. The people there were kind and friendly, and shook our hands and smiled after the service, and we shook theirs. I remember finding it odd how welcoming they had been of these strangers in their midst. I walked up the steps to the door of the church. To my right was a noticeboard, highlighting various community events, but on the top corner, taking up most of it, was a poster from Right to Life with a picture of a foetus in the womb. Right to Life has now taken to issuing press releases against my statements to the media, even going so far as to issue at least one Press Council complaint against a newspaper that published my story, and a Broadcasting Standards Authority complaint against a radio station that broadcast an interview with me. Neither were upheld. Ironically, this same organisation has been decrying that their free speech is being attacked because a Green MP had the audacity to suggest that scared young women might not want to be threatened with plastic babies, placards and prayers when they visited hospitals to undergo the traumatic experience of seeking abortions. I tried the door of the church, and it was unlocked. I walked into the cool, dim interior, and stood in the nave, taking it all in. There was the transept where we had stood and had exchanged our vows. There was the stained glass window in the apse where the light had shone through. There were the rows of pews, on the edge of which I remembered ribbons. The church had been full of our friends and family once. Lecretia had walked in, past where I now stood, accompanied by her father and a bridal march, and approached me in front of the chancel. She had never looked more spectacular that day. And she was never happier. I turned to leave the church and something caught my eye. In the narthex, behind the last pew, was a stack of leaflets. I walked to them and spotted one that was immediately familiar. It was a Care Alliance leaflet, professionally printed, with the telltale dandelion logo in the top left corner. It was a leaflet instructing the reader to write to the Health Select Committee against assisted dying. Inside the leaflet were step-by-step instructions and a list of reasons why assisted dying, according to them, was unnecessary and unsafe. The deadline for submissions had long since passed, but a small stack of leaflets remained, evidence of an earlier agitation. How many leaflets did they print I wondered? Did every church in New Zealand have a similar pile? What words were uttered here, in this place that we married, in relation to me and my wife? I know some opponents throw the words murder and suicide around in relation to assisted dying, were those words uttered here? The Care Alliance, for all its claims of being a group of many faiths and beliefs, certainly knew its audience and where to find its most impressionable supporters. Through the exhortations of priests and ministers, they banged the drum and blew the trumpet. Euthanasia, they must have said, just one more herald of the end of days. The church didn’t feel that welcome all of a sudden. I left, and closed the door, and descended the steps, the same steps I had descended with my bride ten years prior. On that day I was happy, but on this day I was aggrieved and my feelings confused. I walked out and over to the car, started the engine, and drove away. I doubt I will ever return. That must have been truly awful for you Matt. Ive often wondered how churches drum up support for their causes. I know for a fact that they encourage the faithful to sign form submissions to parliament and i wonder how much of the small print the parishioner reads. These people are also not informed that their name will be published online. It is the chuches responsibility to inform them of the correct process. What an awesome description in the most beautiful writing. It’s like your dreams started there and were then destroyed by ghastly illness; just the worst and the church was not there to support you. I wonder what it would have been like if you weren’t the person you are with your amazing strength of character and drive to make some good come out of Lecretia’s short life. 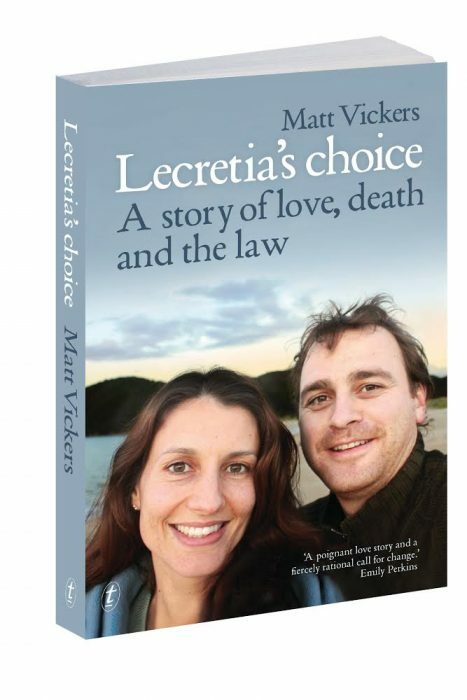 If you had gone back to the church where you were married, for support, believing as you do and Lecretia did in assisted dying for the terminally ill. How would they have reacted when faced with a real situation? I feel that when we are involved in a church, we have to believe in the doctrine that is part of that belief depending on the “religion”, man made. If you go outside of that with your own beliefs, christian ( in the wide sense) and right that they are, in the belief that we should not suffer in death, the “church” does not accept the idea that we could be part of our own dying. I will always be so grateful that you and Lecretia have made me feel and think so deeply about this but eternally sad for your wonderful story. As Damian said, it doesn’t have a happy ending. Of course we know that. Oh, how he always states the obvious. Can’t help but love having him as part of my family, though. Take care, Matt, wherever life takes you from now on. We will never forget Lecretia and never forget how much you loved her and how much you fought in her name to make our world a better place. No matter where you are, kia kaha. Sad to read this Matt. What others think of us is none of our business – we can’t take it personally. That’s heartbreaking. I’m so sorry your beautiful memories were sullied in that way. You have rolled with the punches so far Matt; here is yet another test for you. Don’t stop sharing – a problem shared is hopefully one minimised, if not halved. You know by now how much support is out there for you. A good thing to share Matt – however painful. Your sad experience, Matt, explains why there were so many pathetic and silly submissions exhorting the committee not to interfere with the dying process, even if there is unbearable pain, along the lines of ‘It is god’s job and we are not to interfere. It is all part of his plan. He knows what he is doing’. The ruthless campaign of misinformation is calculated and cruel. Thank you for your devotion to changing the law to allow the one suffering to make their own decision when they have had enough of life. How arrogant to presume people cannot make their own choice. I disagree, David. They’re good people, just wrong about this. I and very many others in St Andrew’s, support personal autonomy in the area of voluntary Euthanasia just as we did for Civil Unions and Marriage Equality and many others before that. Our feeling is if one doesn’t want an assisted death then don’t ask for it. Others who do want it, and qualify and are not being ‘coerced’, should be able to have it! It is such a shame that conservative Christians seem to speak as if they are the only Christian voice – they are NOT. Interestingly, Lord Rix in the UK, who was very against VE and represented disabled groups whom he thought vulnerable to being pushed off the edge somehow, did a complete u-turn when he developed terminal cancer and he could see a painful and/or ignoble end coming over which he had no control. I suspect many conservative Christians opposed to VE may well end up in the same boat when faced with a potentially very bad death of their own. I really feel they have not thought it through properly especially as palliative care is not an answer where one has total control. We may be able to choose our stuffed toy, but somehow that does not seem to be any consolation to still being denied our autonomy.